As most of you know, I’m a huge Food Network junkie. It’s my “go to” channel along with HGTV. 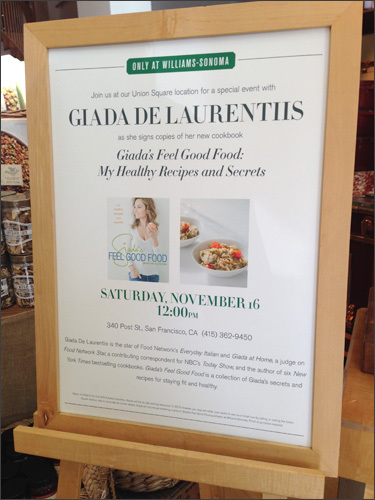 When a friend asked if I’d be interested in going to meet Giada De Laurentiis at her Williams-Sonoma book signing in San Francisco, I jumped at the chance. I was particularly interested because her new book focuses on healthy living/recipes. One of the reasons I haven’t been posting much in the area of recipes is because I’ve been on a healthy eating kick for months and making the same dishes over and over and they are rather plain and boring. Think lots of ground turkey, veggies, soup, salads and broiled/pan seared fish. I was super excited to get a new book filled with vegetarian, vegan and gluten/dairy free recipes… so I could switch things up by saying goodbye to my repetitive and boring meals. One of the most asked questions Giada gets from her fans is – How can she cook and eat all of that delicious food on television and still look fabulous? 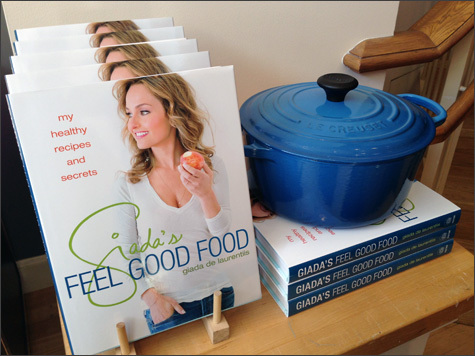 Giada’s Feel Good Food: My Healthy Recipes and Secrets book showcases a collection of her secrets and recipes for staying fit and healthy. It’s a personal look into how she keeps her body and mind in a happy and healthy balance. She doesn’t believe in diets, feels they are tough to stick to and encourage a sense of deprivation or missing out, resulting in roller coaster weight loss and gain. Hello, I sure have been there and done that over the years. Space for the signing event was limited to the first 400 ticketed customers – so as soon as I said, “YES!” – my girlfriend called and reserved our books and signing spots. We decided that it would be good to get there early. 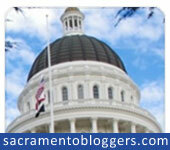 It’s about a 2 hour (with light traffic) drive to San Francisco from Sacramento, CA. We hoped to be able to park in the underground Union Square garage – but knew that we needed to allow for time to change plans if it was full. It was a gorgeous day in the city and we found a spot in the garage rather quickly. 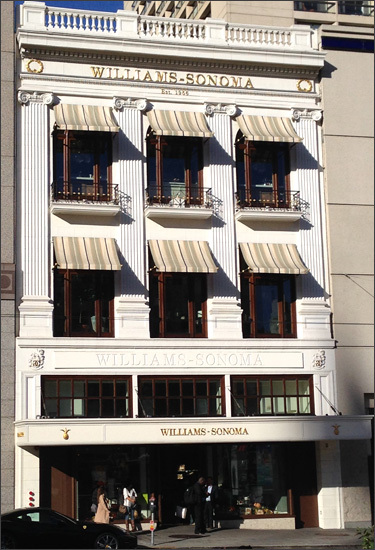 It was perfect, right across the street from Williams-Sonoma. There was a small line out front. We divided and conquered. My friend went inside to will call to get our books and I reserved our spot in the overflow line outside. 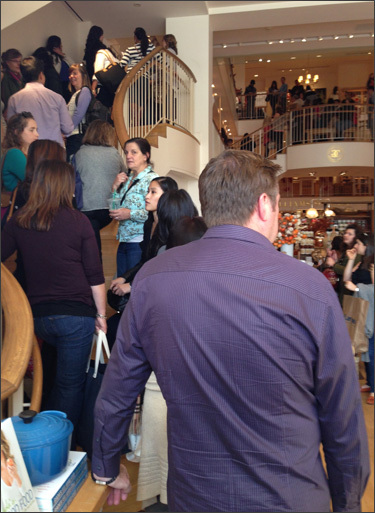 Fans already lined the steps of the 3 story store inside. We arrived a good 2 hours before the signing and ended up in the front of the overflow line outside. The line ended up spanning the entire block and then some. You couldn’t see the end from where we were standing. 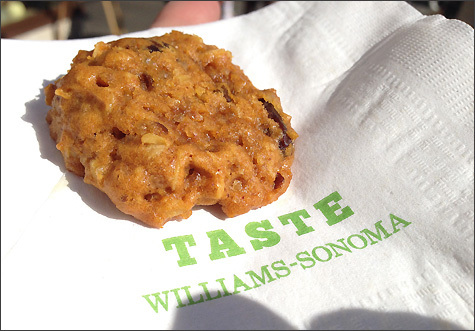 The Williams-Sonoma staff was great. They served water and some of Giada’s book recipes to all of us fans waiting in line. Whole-wheat orzo with artichoke pesto and spiced pumpkin-raisin cookies. Both were delicious! 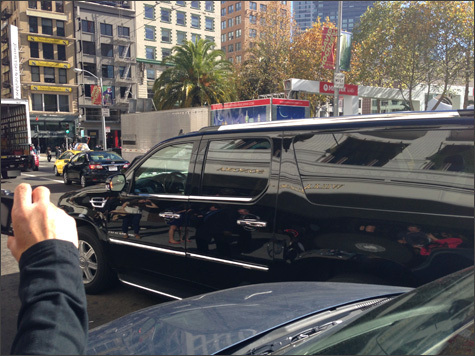 We really lucked out in that we were standing right next to the loading zone that Giada’s car service would be pulling into for her arrival. We also happened to really enjoy the company of the people waiting directly behind us in line. Hi Courtney! Giada was super sweet in the way she greeted her fans – she walked right into the crowd waving and saying “hi” to everyone. She thanked all of us for coming out and said she was excited about the book tour and looking forward to signing our books and meeting everyone. The book signing event guidelines were more strict than any I had seen. Meeting Tyler Florence was super casual… meeting Guy Fieri was very organized, yet felt much more personal. They both encouraged photos – Guy’s people even offered to take photos with fan’s cameras or phones. 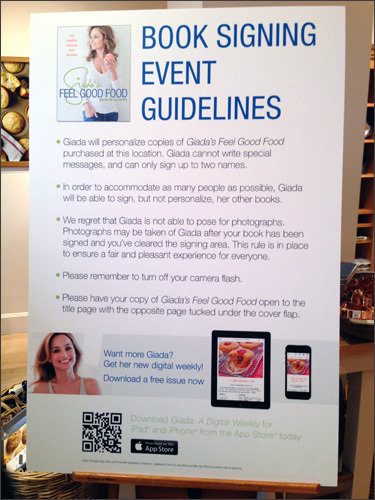 Not so much here… no posed photos with Giada. It did keep the line moving quickly, but there wasn’t much fan interaction. While waiting in line, my girlfriend noticed Russell Jackson, one of the contestants from season 9 of the Food Network Star working the crowd. He decided to surprise Giada and the friend that was with him told us that she was super excited to see him. This all happened on the stairs to the third floor. He shared that a group of girls yelled – Hey look, it’s the guy from Top Chef, LOL… uh, no… it was pretty funny – our group yelled… bourbon and bacon! 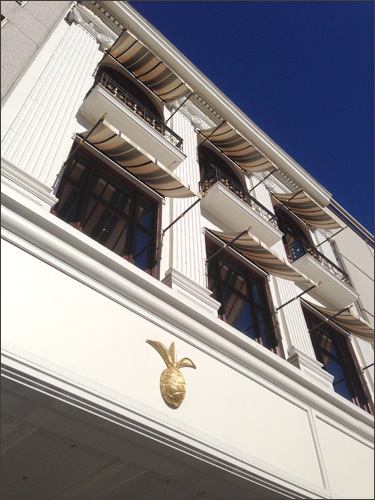 from our position in line – he loved it! He made his way down to the landing we were standing on and posed for photos with us. Super nice guy, funny picture! We continuing weaving through the floors of the store. 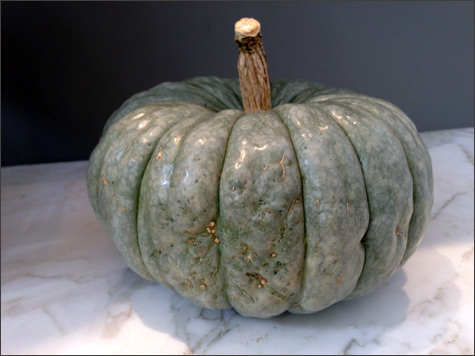 I was kind of obsessed with this pumpkin… there was lots of merchandise and decor to look at as we stood in line. We finally made our way to the third floor and Williams-Sonoma staff made sure we had a post-it with the name we wanted signed in our book and that the books were opened to the right spot. It happened so quickly. She signed my book before I even got to the table. 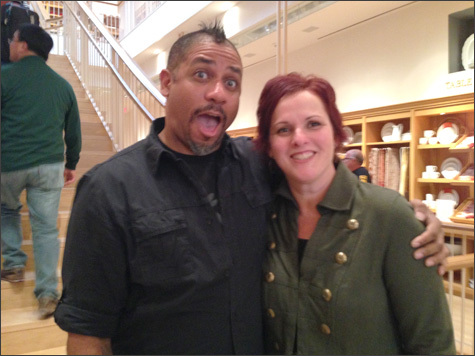 Since we weren’t allowed to pose for photos with her, all I had time to say was, “hi” – she thanked me for buying the book and I said something lame, like… I’m a huge fan and that was all the time allowed. My girlfriend did mention to Giada that she saw her recent appearance on Late Night with Jimmy Fallon (Playing Catch Phrase) and (Cooking) and that she almost peed her pants from laughing so hard… that really made Giada laugh, so that was fun! 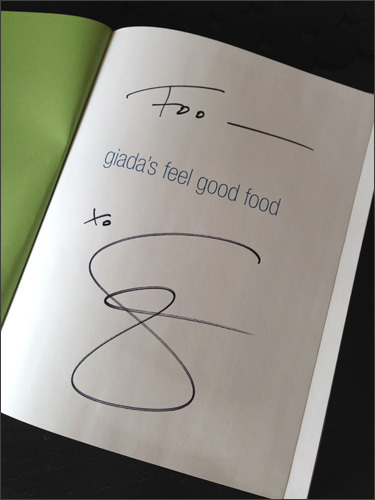 Even though it was pretty impersonal… I did get the feeling that Giada was generally excited to see all of her fans. I’m really glad we got to participate in the event. 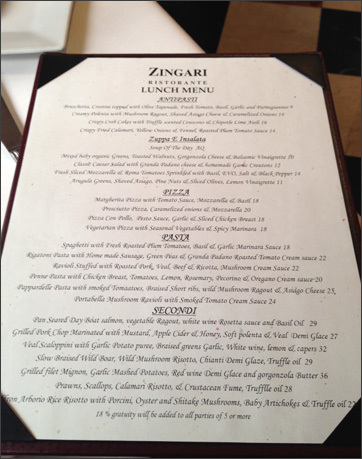 After the signing, we decided to grab some lunch at Zingari, a nearby restaurant at 501 Post St. We’d been standing for hours and pretty much just wanted to sit down. We ducked into the first restaurant that looked half-way decent. We didn’t look at Yelp or other reviews, we just wanted to sit down and eat. 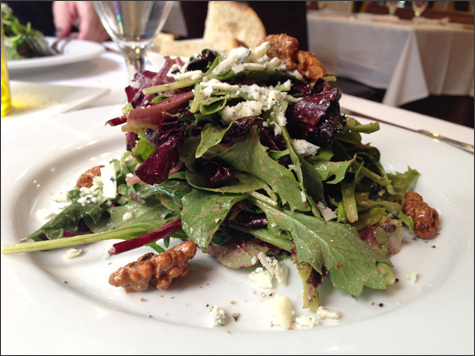 We decided that the salads and bread were a big tease… they were excellent! We also decided that they should probably take their pizza off the menu. 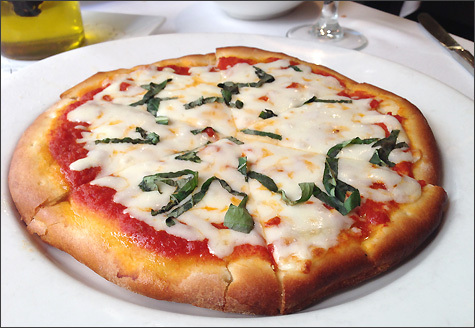 Not sure you can actually make the claim that your pizza is authentic margherita pizza with tomato sauce, mozzarella and basil… and not use fresh sauce, fresh mozzarella, and good dough. The dough resembled buttered biscuits and not in a good flaky way. It was rather disappointing – think frozen… but thankfully the bread and salad were very tasty. After lunch we strolled back in the direction of the parking garage, but not before stopping to look at the Christmas tree and ice skating rink in the heart of Union Square. 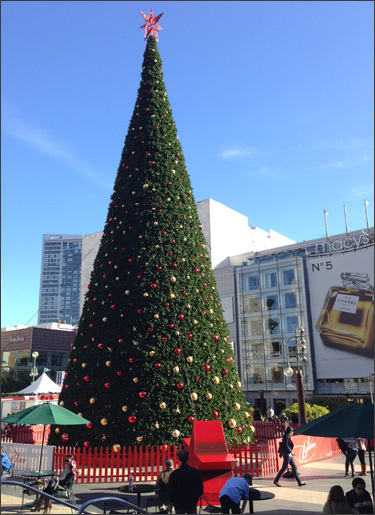 Is it really almost Christmas? How did that happen? I’d like to just put that aside and enjoy one of my most favorite times of year… Thanksgiving. 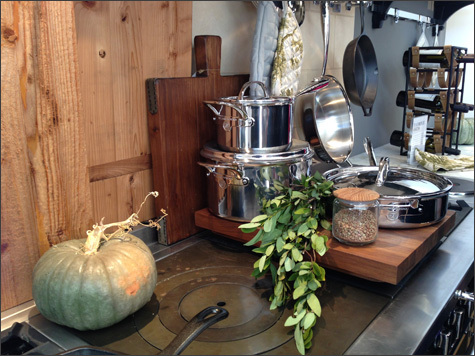 I’m looking forward to time off from work, laughing and hanging out with family and friends… and cooking up a storm. 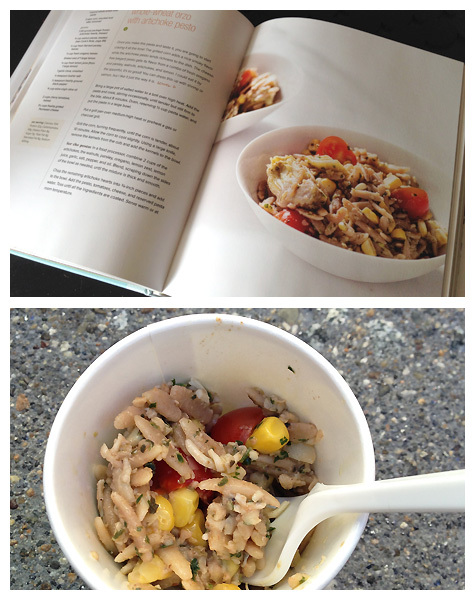 I’m bringing veggie dishes this year… already have a few recipes in mind. I find that to be very true for myself. I’m always in a much better space mentally when I treat my body better. The book was a nice reminder of that. I have a lot of things to be grateful for and I plan on celebrating all of them in the upcoming weeks and throughout the new year. So glad you were able to meet her! I went to San Jose when she was there. Same experience but they didn’t limit how many people were there since the line could go up and down the street easily. I waited in line for 4 hours! It was great to meet her but I think I don’t have to do it again! HA! 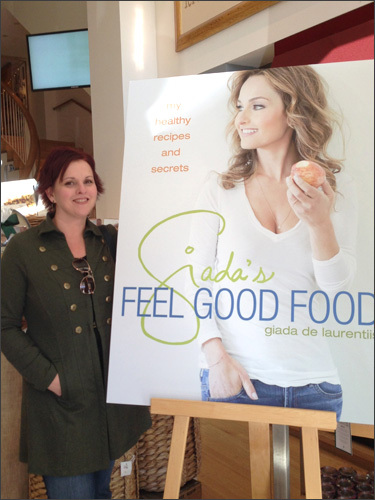 Love Giada though! Just got done having one of my favorite soup recipes of hers. Turkey, Kale brown rice soup. Its on Food Network! So yummy and very healthy!